This pot rack has two 5/8-inch bars that are 36-inches wide, each of which have five S-hooks that slide along the bars to hold the pots, as you can see from the image above. This allows for adjustable horizontal positioning of the pans as necessary. The rack hangs on a hidden wedge bracket, sometimes referred to as a french cleat. This cleat absorbs all of the weight of the pans and transfers it to the wall studs without putting undue vertical pressure onto the fasteners. When you want to take the rack down to clean the wall, simply lift the rack off of the cleat. This is a fun and practical project to build, and one that adds not only a great look to her kitchen plus (at least for a while) the smell of aromatic cedar as well. Download the free to build this woodworking project in your shop (PDF). To begin building these rustic pot rack plans, you'll need to cut the boards to the appropriate lengths with a circular saw or compound miter saw. Cut two sections of rough-cut cedar 2x6 at 24-inches, and another at 34-1/2 inch for the french cleat. Follow this up by cutting two sections of cedar 2x4 at 34-1/2 inches and one length of cedar 1x6 at 34-1/2 inches. With all of the boards cut to the proper lengths, the next step in these free rustic pot rack plans is to rip the french cleat. For this task, you'll need a table saw with the blade tipped to a 45-degree angle. Set the saw's fence so that you're cutting directly through the center of the board, leaving two identically sized boards, each with a 45-degree bevel on one side (as shown in the image above). When cutting a thick board with a steep bevel such as is required by this step, use a sharp saw blade, with the blade height no more than about 1/4-inch higher than the top of the board. Do not force the board through the blade excessively, but allow the speed of the cutting dictate how quickly you should move the board forward. Also, be sure to stand a bit to the side of the board (rather than directly behind it) so that you're not struck by the board in the event of a kickback. Finally, hold the board firmly against the table top and the fence to keep the board from riding up the blade. When you're ready to proceed with the cut, rip the 34-1/2 inch long piece of 2x6 through the center as shown. With all of the parts cut and the french cleat ripped in two and ready to go, the next step is to mark the locations for drilling the holes for the two iron bars. The holes locations need to be precise, and the holes should be drilled to a specific depth with a forstner bit in the next step. On the inside, front faces of one of the two vertical 2x6 boards that comprise the side frames of the unit, make a pencil mark three inches down from the top and 1-1/2 inches in from the front edge. Then, make a second pencil mark 1-1/2 inches up from the bottom and 1-1/2 inches in from the front edge. Repeat with the inside face of the opposite board, in the same locations. With the hole locations marked, the next step in these free rustic pot rack plans is to drill the holes for the two iron bars. Set up a drill press with a 5/8-inch forstner bit to drill the holes in the vertical side pieces. Adjust the depth stop on the drill press to be no deeper than 1/2 the thickness of the board. Position the pencil mark directly beneath the point of the forstner bit, and turn on the drill press. Plunge the bit into the wood until you reach the depth stop, then retract the bit. Repeat with the other hole in the same board, then drill the corresponding holes in the opposite board. Before you can begin the assembly process of these free rustic pot rack plans, you'll need to rip the bottom stretcher. Set up your Table Saw fence so that it is 3-inches from the edge of the blade, and raise the blade to about 1-3/4 inches high, square to the table top. Place the bottom stretcher flat on the table, against the fence, and rip the stretcher to 3-inches in width as shown in the picture above. Time for a little bit of pre-assembly. Place the two side boards with the bar holes on edge facing one another on a work table, then align the top 2x6 and the bottom 2x4 on edge stretching between the two sides, as shown in the you downloaded in the first step. Place the french cleat directly beneath the top stretcher along the back edge of the side stiles with the bevel facing the work table. Next, mark positions for a pair of pilot holes to be drilled through each of the two side boards into the two stretchers and french cleat. Drill these holes with counterbores into the side boards using either a Drill Press or Cordless Drill. At long last, it's time for some assembly. Align the two sides, the top and bottom stretcher and the top half of the french cleat in position on a table top. Insert the two iron rods into the holes in the side stiles and align all of the parts, checking the corners with a Combination Square to make sure that they are square. Then, drive a 3-inch screw through each of the pre-drilled holes with a Cordless Drill or Power Drill to connect each of the pieces. NOTE: If the opening on your S-hooks is too narrow for them to slip over the installed iron bars, you will want to slide them onto the bars before installing the bars into the rack. With the major portion of the assembly of the rustic pot rack completed, the time has come to hang the french cleat on the wall, in preparation for hanging the rustic pot rack. Begin by determining exactly where you want to position the rustic pot rack on the wall. Make a light pencil mark on the point on the wall where the top of the rack will be positioned.Next, measure the distance from the top of the rustic pot rack down to the bottom point of the french cleat. Then, back on the wall, measure down from the pencil mark the same distance and make another mark. This is where you'll mount the french cleat, with the point where the back begins to bevel away from the wall even with the lower pencil mark.For the moment, pull the cleat away from the wall, and locate the studs behind the drywall. You may wish to use a stud-finder for this task, but another method is to tap on the wall with your knuckles, listening for the differences in sound. When you tap over a stud, the sound will be solid, whereas tapping over the gap between the studs sounds hollow.Make a light pencil mark on the wall to denote the center of each of the studs to which you want to attach the french cleat. Reposition the cleat back onto the wall, using a small level to ensure that the cleat is perfectly horizontal. Then pre-drill a pair of counter-bored pilot holes through the cleat (one hole above the other, about an inch apart) to match the center of each of the studs.Re-check the position of the cleat with the level, and drive a 3-inch screw through each of the counter-bored holes into the studs behind the drywall. Tighten these screws fully, to be sure that the cleat is securely fastened to the wall. With the wall portion of the french cleat installed, you may proceed with hanging the rustic pot rack on the wall. Simply position the pot rack so that the wall-mounted portion of the french cleat fits between the sides of the rack. Then lower the entire rack down until the two portions of the french cleat meet. The angle of the cleat will hold the rustic pot rack securely against the wall. With the rustic pot rack hanging securely on the wall, you'll need to prepare the cleat cover to hide the french cleat from view. Measure the distance (vertically) from the bottom of the top stretcher on the rustic pot rack down to the bottom of the french cleat that is installed to the wall. This will be the width to which you need to rip the cleat cover, which is a section of 1x6 rough-cut cedar. Set up your Table Saw fence so that it is this same distance from the edge of the saw blade. Adjust the height of the blade to about 1-inch above the table, and rip the piece of 1x6 cedar. Next, measure the exact width of the opening in the rustic pot rack between the two vertical 2x6 stiles. This is the length to which you need to cut the ripped cleat cover before you mount it onto the cleat in the next step. Position the cleat cover in between the two vertical 2x6 stiles, and over the two portions of the french cleat. The cover should be just tall enough to hide the cleat and be flush with the bottom edge of the wall-mounted cleat. Mount the cleat cover by nailing it to the lower half of the french cleat with a hammer and a pair of 4-penny (4d) nails. Your rustic pot rack is now complete. 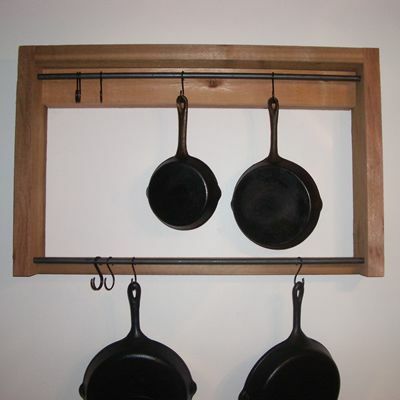 The only remaining step is to hang your pots and pans on the rack.If you didn't mount the S-hooks onto the two iron bars when you assembled the rustic pot rack, place the hooks onto the two bars as desired. Then, hang each of the pots and pans by hooking the hole in the pot handle onto one of the S-hooks, as shown in the picture above. You can move the S-hooks to any position along the two racks to allow for mounting as many pots and pans as you need.